HONORABLE MENTION -- Tom Petty and the Heartbreakers -- "Damn the Torpedoes": from the brink of a breakup to a top ten album in one year. Record album prices have climbed even more drastically than prices overall, and (of course) it looks as if the upward spiral has no end. Singer Tom Petty (of Tom Petty and the Heartbreakers) is making a brave stand against inflation. His parent record company, MCA, wants to market his next album at $9.98. Petty insists that it will be sold at the current $8.98 price or not at all. There could be a lawsuit before the matter is resolved, but Petty seems so certain he's going to win this argument that he's decided that the LP, scheduled for March release, will be titled "$8.98." 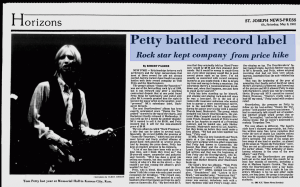 Relationships between rock performers and the large corporations that most of them record for are not always cordial, but few rockers have fought as many battles with their record company as Tom Petty and the Heartbreakers. The group's album "Damn the Torpedoes" was one of the best-selling rock lp's of 1980, but it was released only after a yearlong contractual dispute that at one point found Mr. Petty filing for bankruptcy and ended only after MCA records granted him the right to become the major artist on the smaller, more "personal" MCA subsidiary label, Backstreet Records. The next Heartbreakers' album has been eagerly anticipated since "Damn the Torpedoes" stormed to the top of the charts, and Backstreet finally released it today. It was held up for a month by another dispute: MCA wanted to sell it for $9.98, and Mr. Petty insisted that it sell for the now-standard price of $8.98. The new album is called "Hard Promises," a title that can be taken in several ways. Musically, the record fulfills the promise of "Damn the Torpedoes," which was one of the most lyrical and finely crafted albums of guitar-band rock-and-roll in several years. And by keeping the price down, Mr. Petty has kept an implicit promise to his listeners. He has gorgeous, wispy light blond hair. He knows just how to hold a cigarette, a guitar and a note. He knows just when to whimper, when to enunciate, when to slur his words and when to crack his voice as if he is faint with ardor. He knows just how to emit a tuneful "ooh!" In short, Tom Petty posesses all the requirements of top-40 stardom. He and his band, the Heartbreakers, create unpretentious rock tunes that are as easy to like as Ringo Starr, though more intelligent. Petty recently gained even wider support by battling MCA over the cost of his new album. At his insistence, "Hard Promises" will sell at $8.98, a dollar cheaper than the proposed list price. This fight was so well-publicized that Petty had quite an image to maintain by the time the album finally appeared on your local Fred Meyer racks. Would this Friend of the People deliver good music as well as good intentions? NEW YORK -- Relationships between rock performers and large corporations that most of them record for are not always cordial, but few rockers have fought as many battles with their record company as Tom Petty and the Heartbreakers. The group's album "Damn the Torpedoes" was one of the best-selling rock lp's of 1980, but it was released only after a yearlong contractual dispute that at one point found Petty filing for bankruptcy and ended only after MCA records granted him the right to become the major artist on the smaller, more "personal" MCA subsidiary label, Backstreet Records. The next Heartbreakers' album has been eagerly anticipated since "Damn the Torpedoes" stormed to the top of the charts, and Backstreet finally released it Wednesday. It was held up for a month by another dispute: MCA wanted to sell it for $9.98, and Petty insisted that it sell for the now-standard price of $8.98. The new album is called "Hard Promises," a title that can be taken in several ways. Musically, the record fulfills the promise of "Damn the Torpedoes," which was one of the most lyrical and finely crafted albums of guitar-band rock-and-roll in several years. And by keeping the price down, Petty has kept an implicit promise to his listeners. "A lot of our fans have been with us for a long time, and I think they trust us," the 29-year-old singer, songwriter and guitarist said recently. "MCA has done a great job selling our records, but they couldn't see the reality of what it's like on the street -- they couldn't see that raising the album's price wouldn't be fair." Tom Petty and The Heartbreakers' Hard Promises (MCA/Backstreet) isn't the searing revelation that Damn the Torpedoes was 1½ years ago. 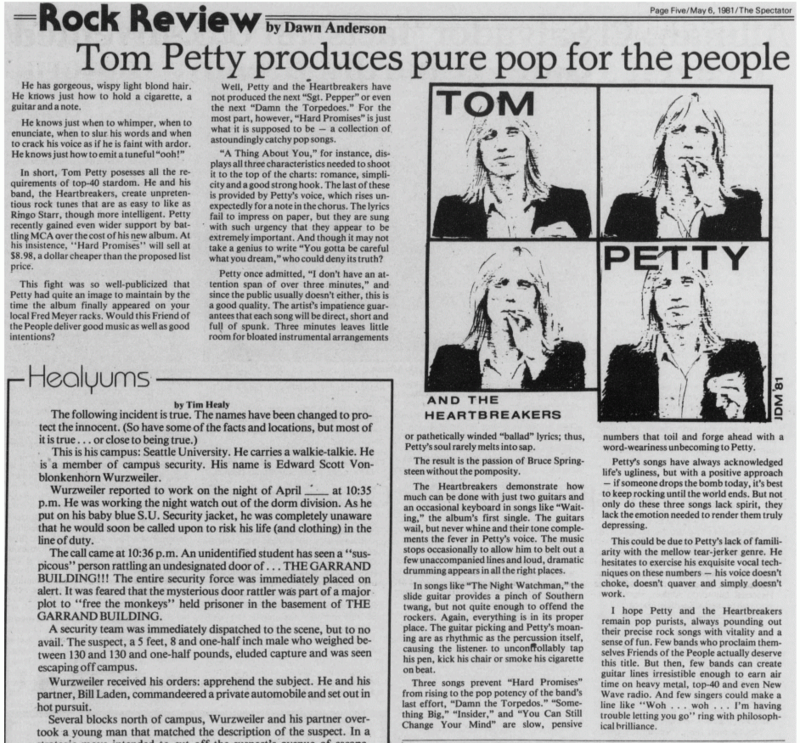 With sales of several millions, Torpedoes rocketed Petty and his band right into the top rank of American bands. Hard Promises does the job of cementing that reputation in place with a potent package of romantic ballads and stripped-down rock that matches anything the contemporary music mainstream has thrown out so far this year. 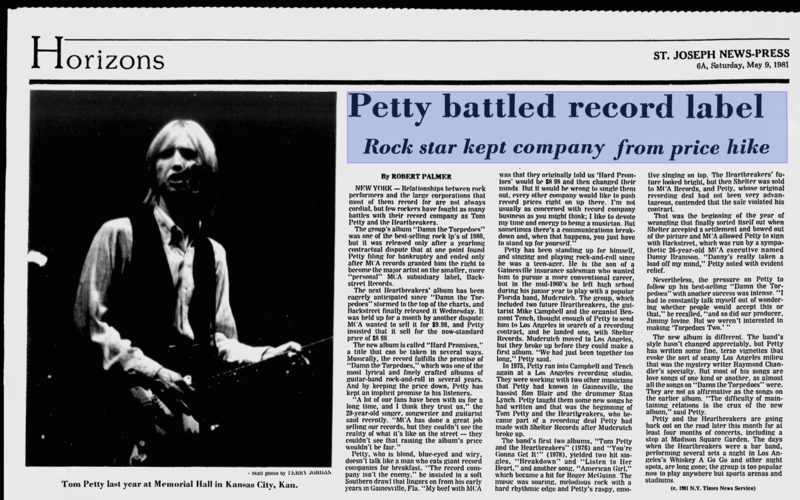 Damn the Torpedoes was mostly written about Petty's hassles with his record company and management (now both former) and his determination not to compromise his way to success. Hard Promises deals to some degree with the realization of dreams but just as much it comes to terms with the fact that, although he's not top billed, Petty's reputation depends must as much on his next record as his last. The love songs are bittersweet, about lost romance and trying to make it. The rock comes from the darkest part of the night and details petty criminals, petty endeavors and life in the loser's lane. 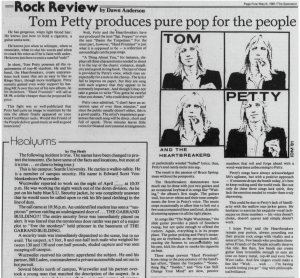 Those who discovered Tom Petty and the Heartbreakers with "Damn the Torpedoes" shouldn't expect a replay on "Hard Promises." Although Petty has once again surrounded his unabashed romanticism with that jangly 12-string guitar, this record leans more towards the raw, moodiness of his first two albums. The Heartbreakers' sound can best be described as complete. Neither holes nor excessive instrumentation mar "Hard Promises." Benmont Tench's keyboards, which played such a prominent role on "Torpedoes," once again provide a vibrant, swirling backdrop for the guitars of Petty and Mike Campbell. The two balance each other perfectly as Petty's rhythm guitar punctuates Campbell's leads with precision. Last year, Petty walked the fence between traditional rock and new wave quite successfully. His vocal style went uncloned. To this day, the only major recording artist to even approach Petty's mood is Elvis Costello. After the opening cut, it becomes apparent that this album will not depart significantly from his debut, musically, or lyrically. Again, I'd like to stress that this is not necessarily bad; "Hard Promises" is likely to please those who enjoyed Petty's last effort. A couple of notes; a lyric sheet is included and the album has been mastered at half-speed, supposedly increasing the fidelity. I could notice no difference between this album and other recently-released albums. Maybe you can.